3200 m high Hasan Dağ (Mt. Hasan) in winter. 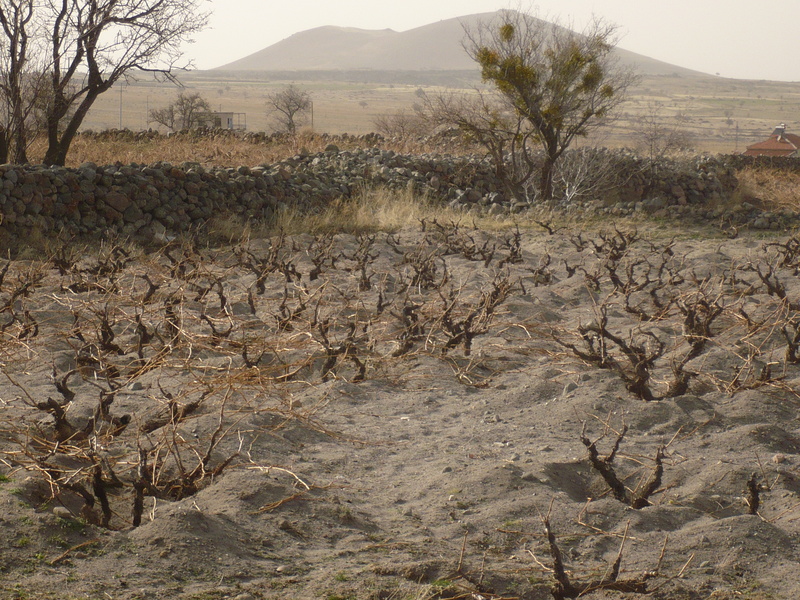 Our vineyards are located just below the volcano, about 1500m high. 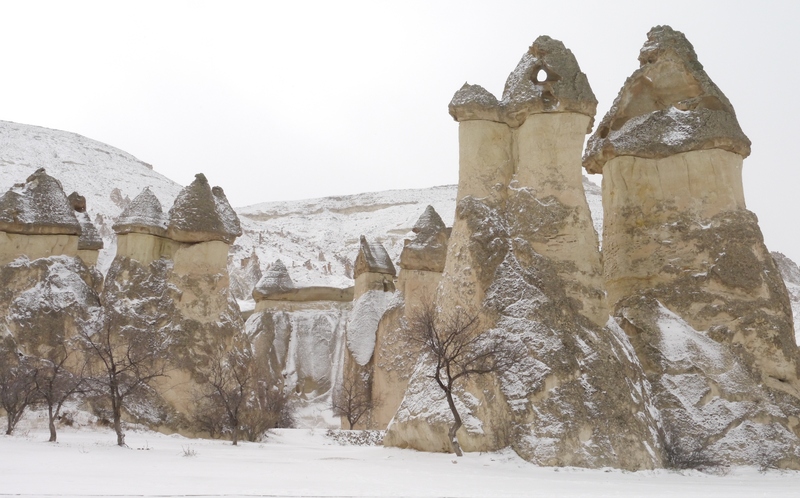 January and February are the cold months in Cappadocia. Temperatures may be as low as -20° C with snow up to 80cm high, but never for longer than three weeks. The small roots that have grown directly beneath the tuff over the past months are uncovered. 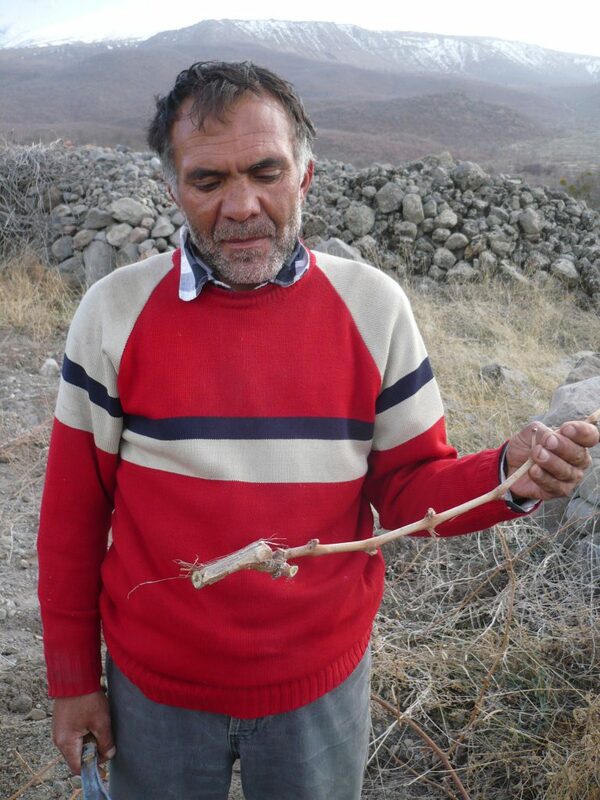 This is also the time for pruning the vine. 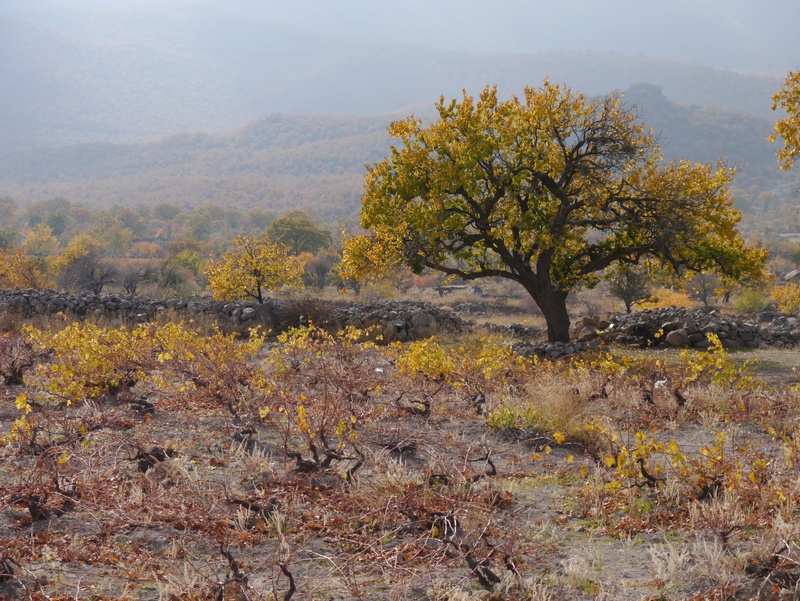 There are a large number of extremely old vines in the fruit-gardens at Hasan Dağ. 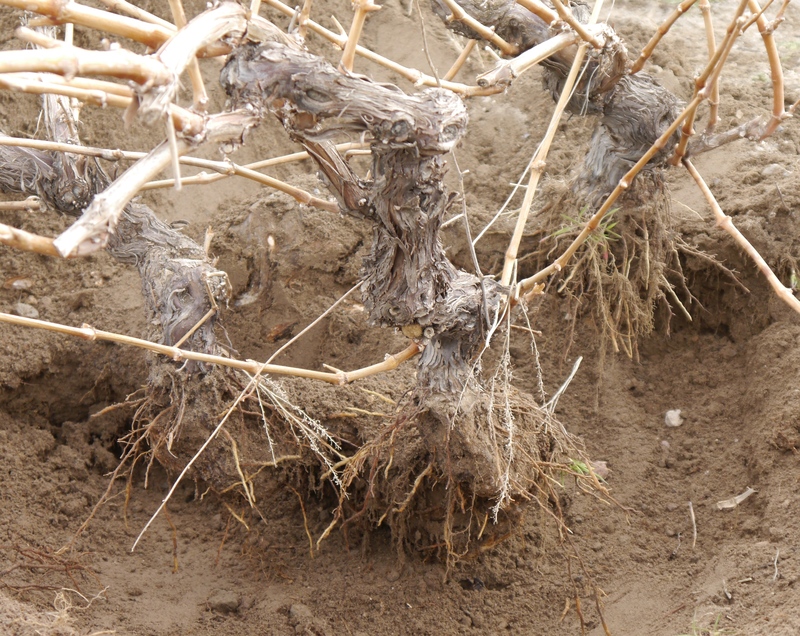 During the following weeks the roots dry up and fall off shortly afterwards forcing the vine to spread its roots further down into the ground. 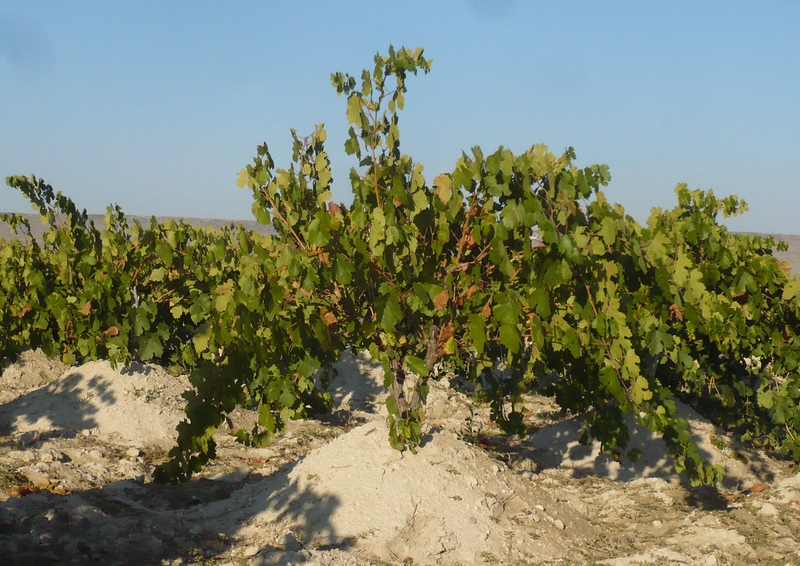 The detrimental phylloxera is unable to develop in the sandy tuff that has dried up to over nearly 60cm already in April. 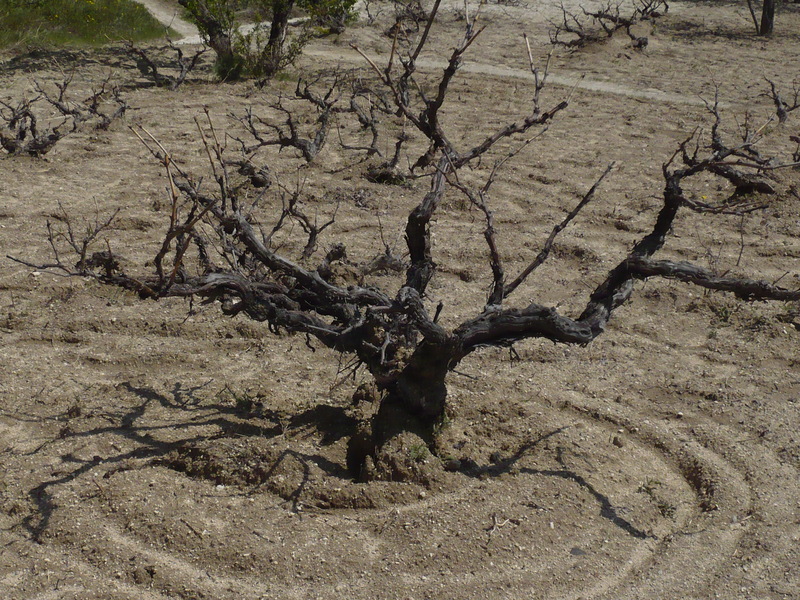 A new vine can easily be planted by using a cutting. 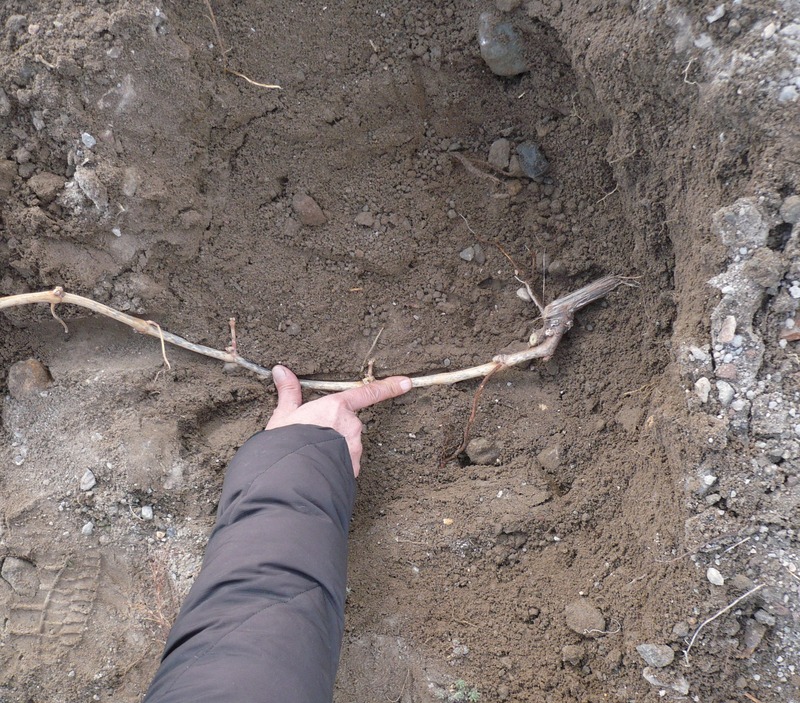 The tuff soil also allows direct vegetative propagation of vines. 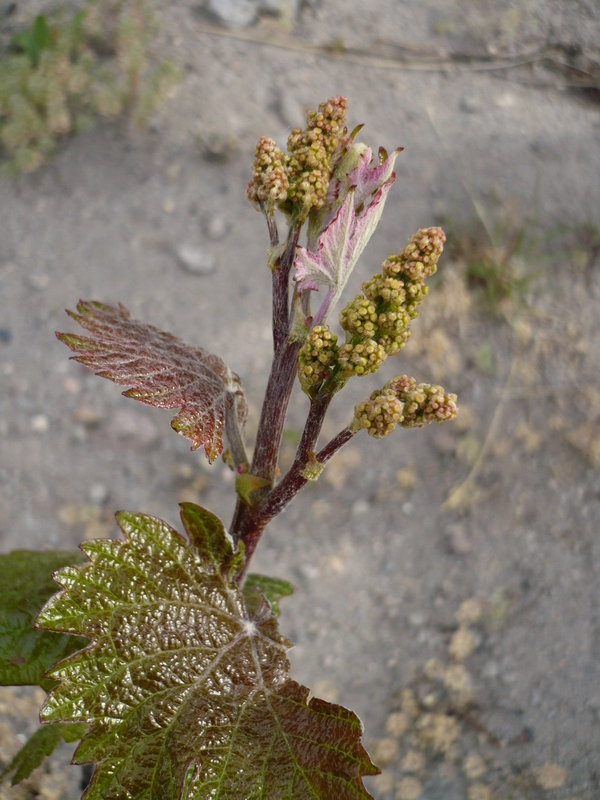 Our vines do not need phylloxera resistant American groundwood vines onto which local shoots are grafted. 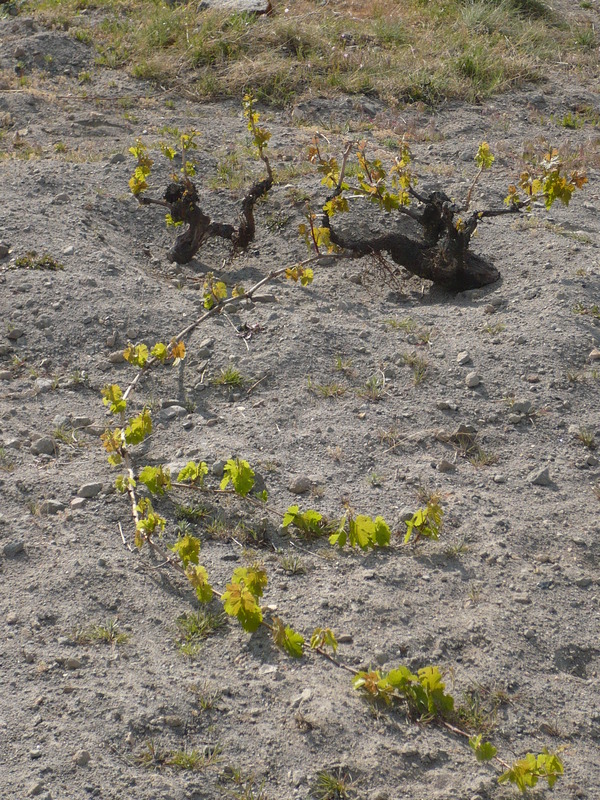 As the picture shows, new vines next to already existing ones can be grown by planting cuttings. 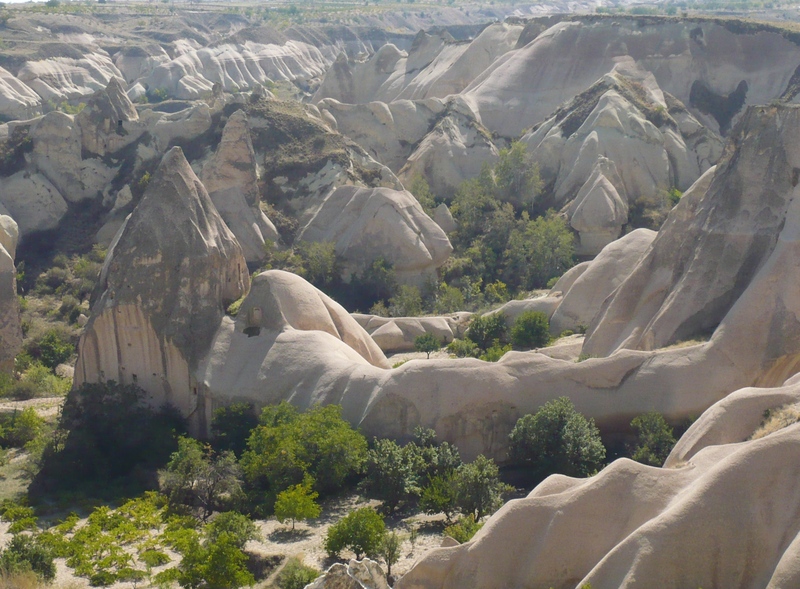 Part of a several meter long cutting is buried in the tuff at the appropriate place. 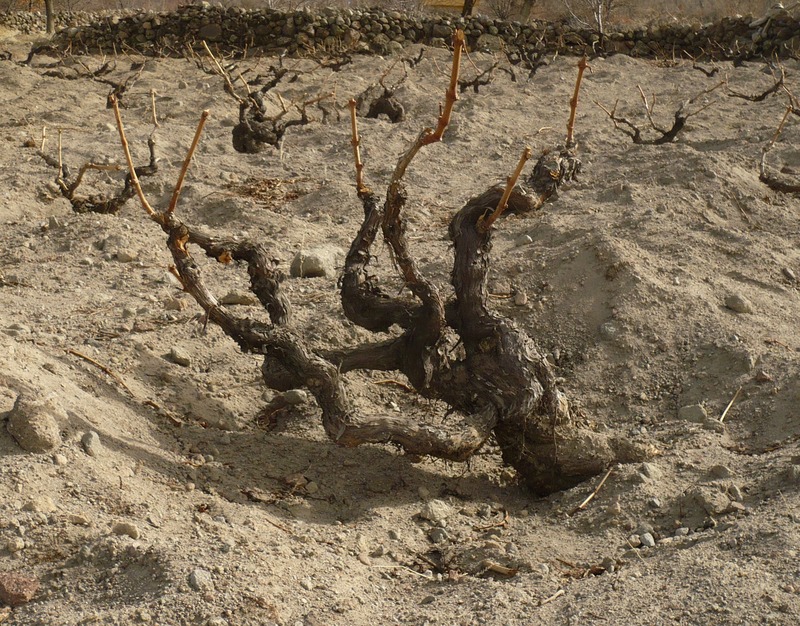 When the piece is well established in the ground the following year, it can be cut off from the vine. 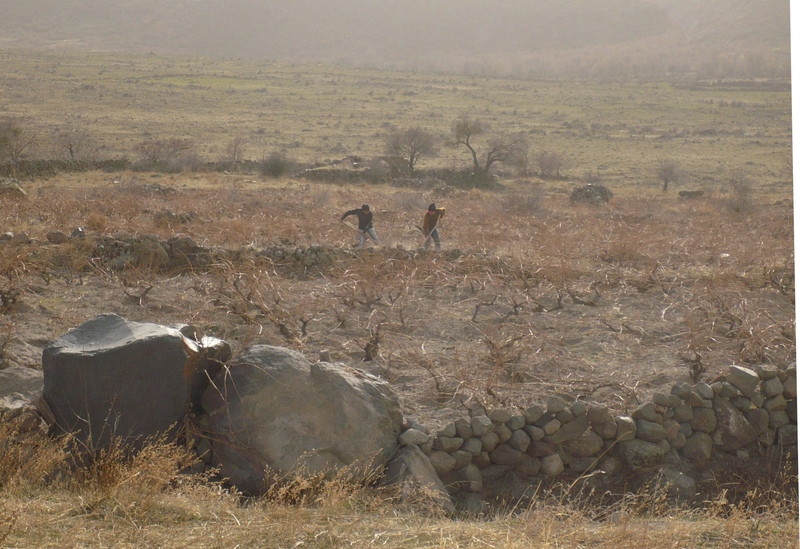 In May the area around the vine is again filled with soil. 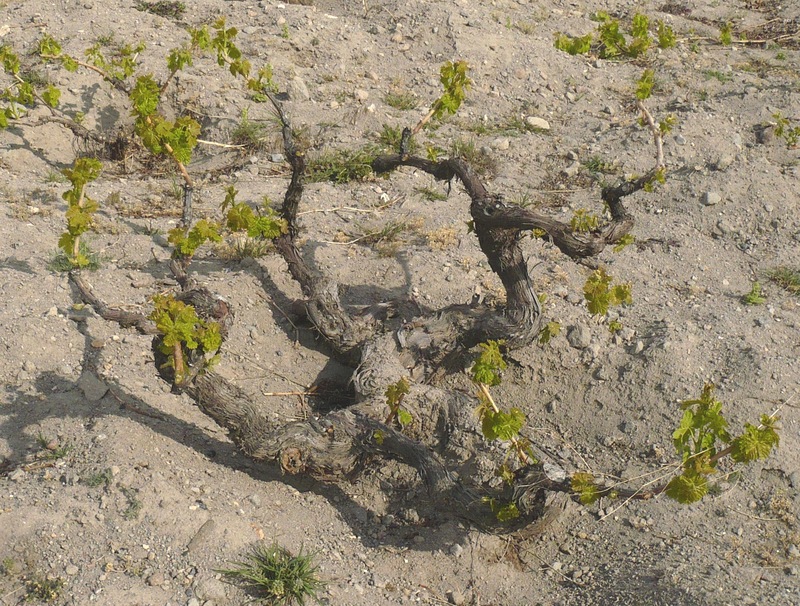 During the following months the vines develop fast and become strong. 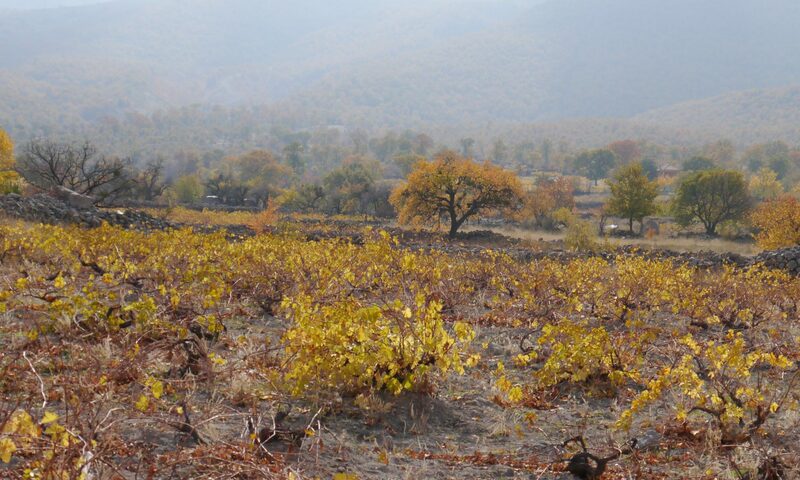 Our vines all grow in private fruit gardens, four to six grape varieties alternating with different fruit trees. 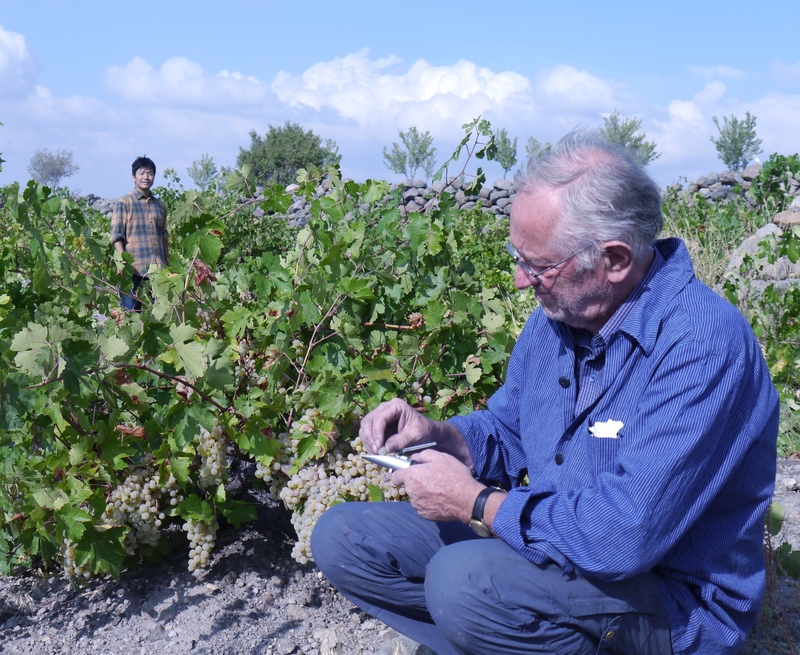 The owners use the grapes in various ways. 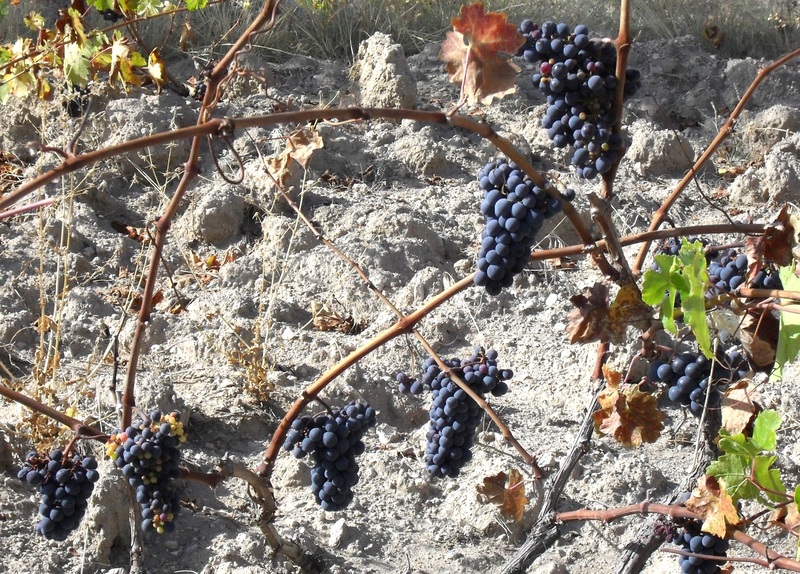 Some varieties are suited to make wine. 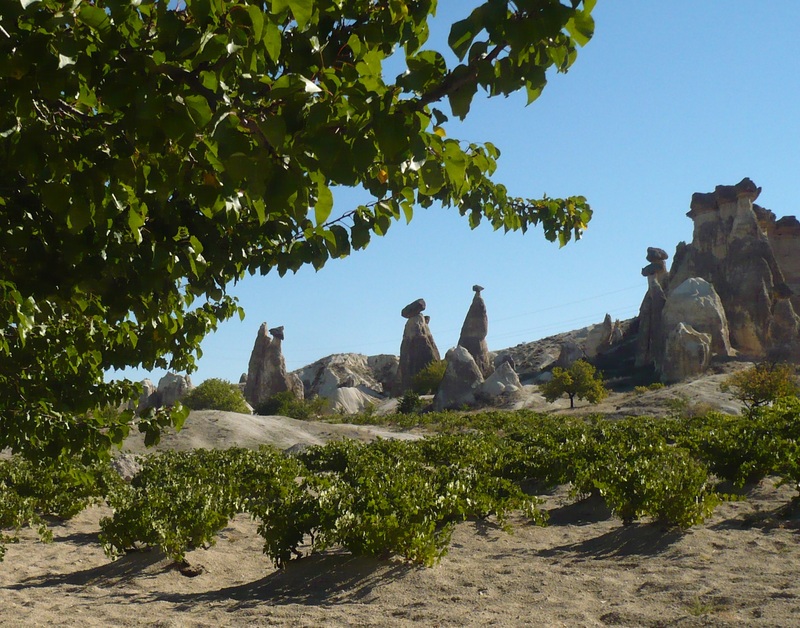 The tuff valleys in the region of Nevṣehir are particularly dry and hot in summer. 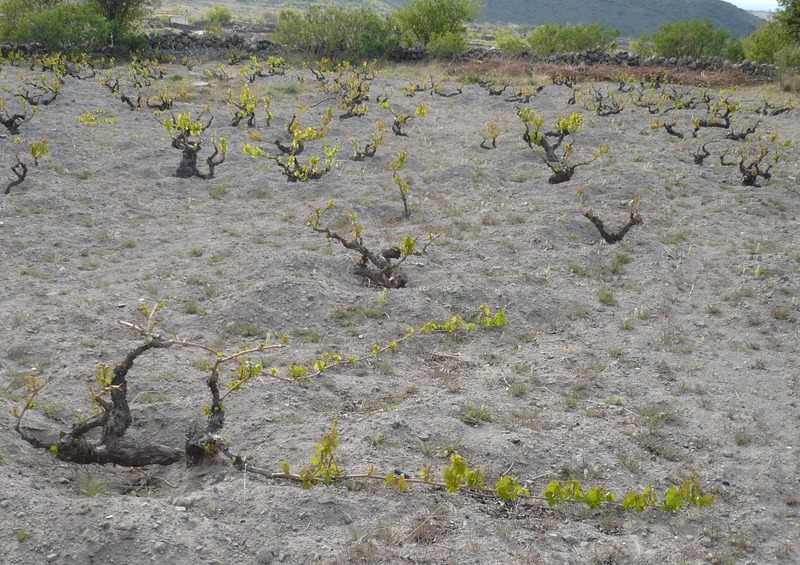 The deep tuff ground, however, secures a well-balanced water base, protecting the vines against desiccation. 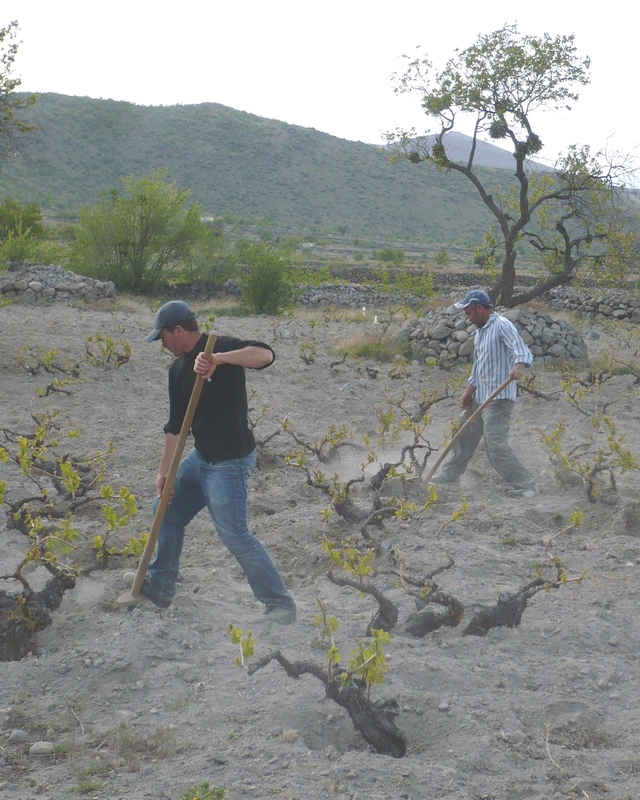 Many winegrowers protect their vines every year by piling the tuff high around each plant. 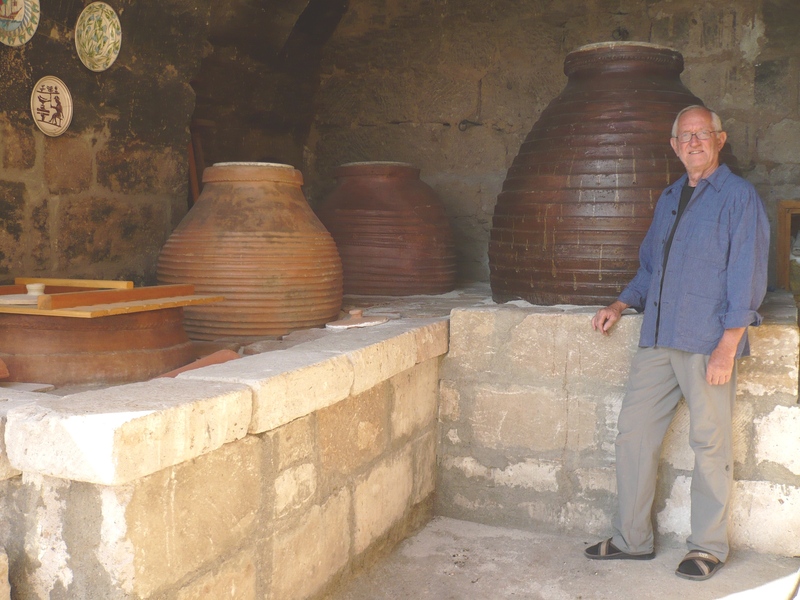 In May we start bottling our wine, tending our clay casks (küps), and performing lots of different chores in the yard and cellar. 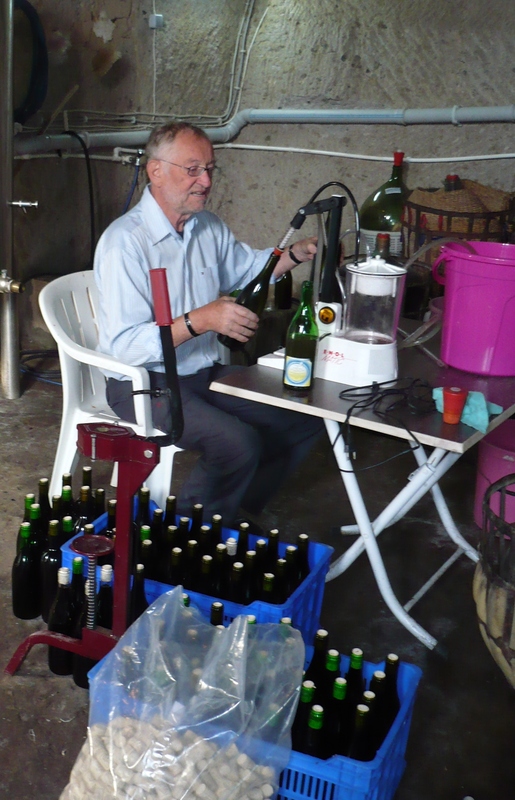 Our bottles are filled by hand, by means of a small vacuum pump. To keep our küps hygienically clean and tight they are heated up to about 80-100°C with a “küp-oven” before the inside surface is smoothed out with beeswax. Heating has to be done carefully and uniformly. 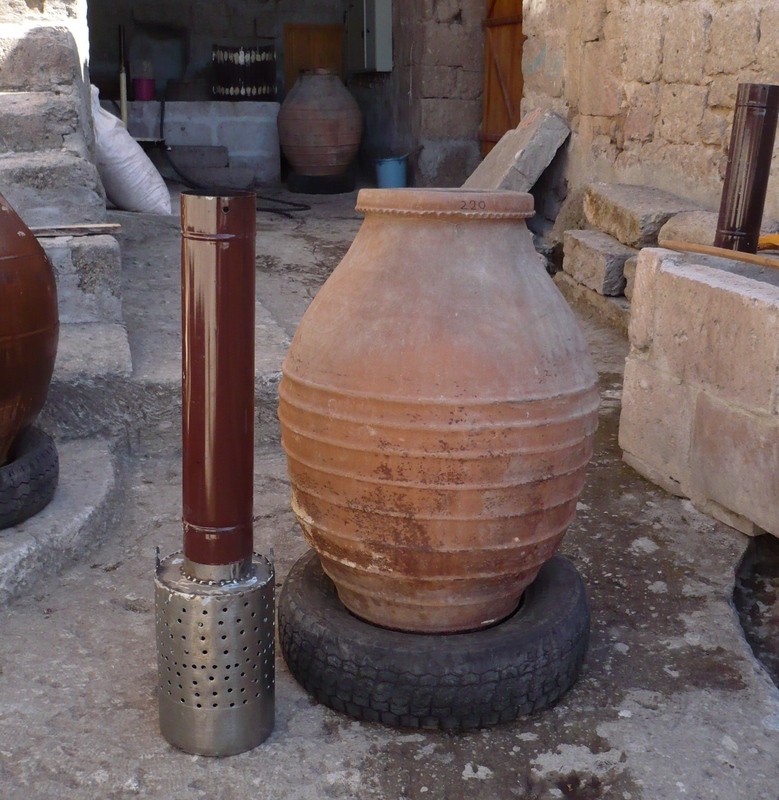 Depending on the size of the küp it takes between two and five hours. Smoothing out with beeswax is comparatively easy with küps that contain about 250liters but with up to 2000liter clay vats the job has to be split into several stages. In the meantime the grapes are ripening in the gardens. 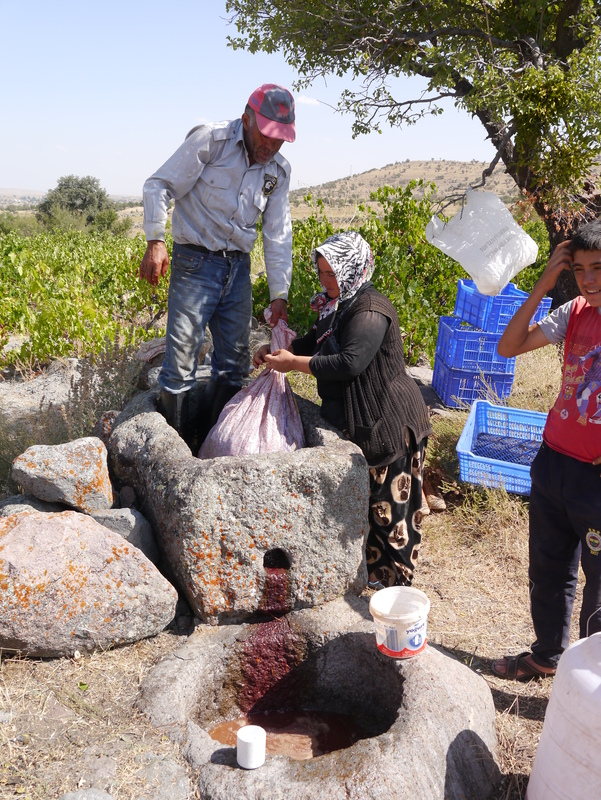 The average annual rainfall in the Hasan Dağ area is about 320mm. 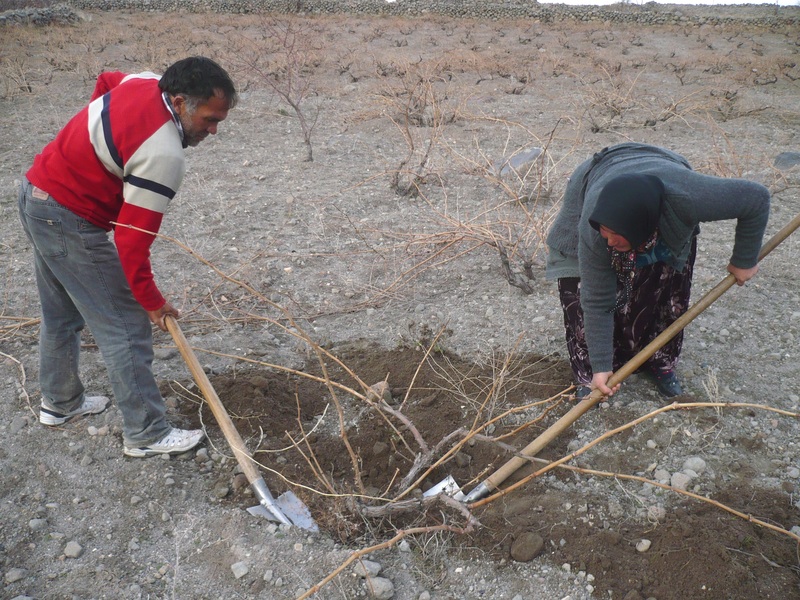 Quite often there is no or very little rainfall between June and September, which is hardly a problem for deep-root plants like fruit trees and vines, though. 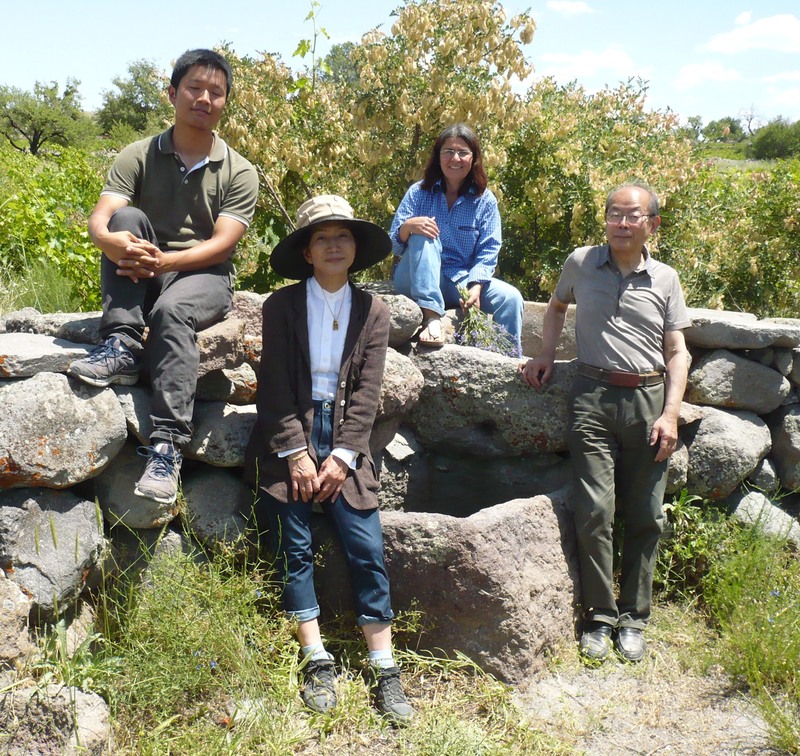 Owners and co-workers of the wine company RACINES (Yasuko Goda) in Tokyo came to visit us and to see our fruit-gardens, the old winepress and the even older küps. 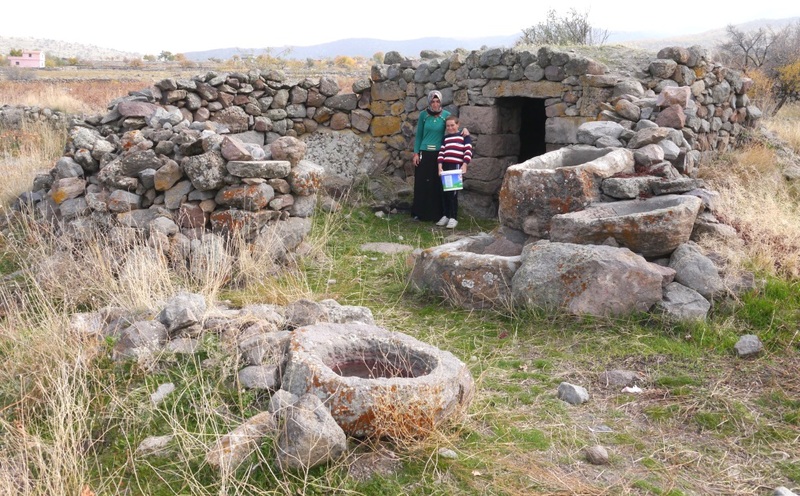 They are eager to gain some knowledge about our natural production techniques and regional traditions. 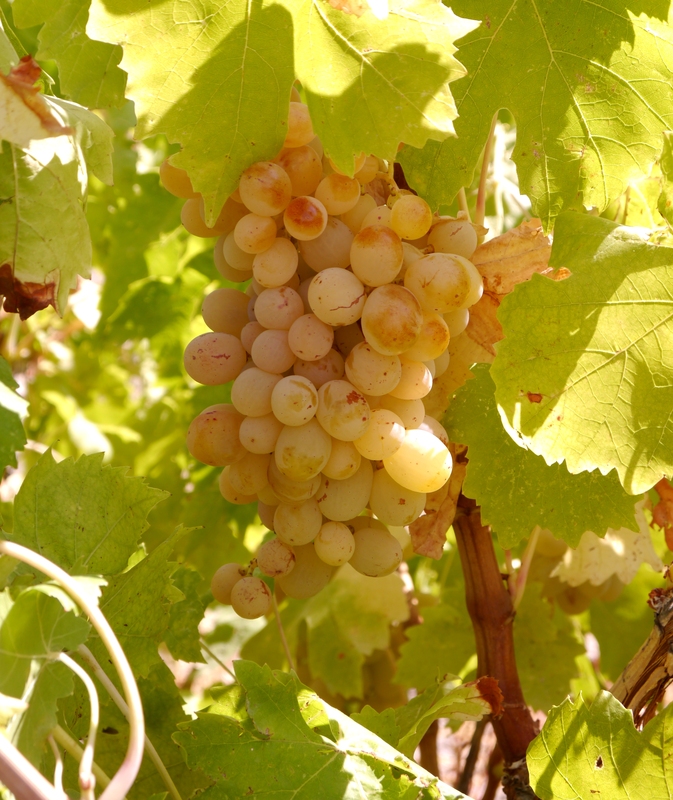 Our white grapes quickly reach a sugar content of 100° Öchsle or even higher. With dry wines, this results in a high alcohol content, which we try to avoid. The sugar content is easily measured with a refractometer. Our friend Rei Goda is helping with the harvest. 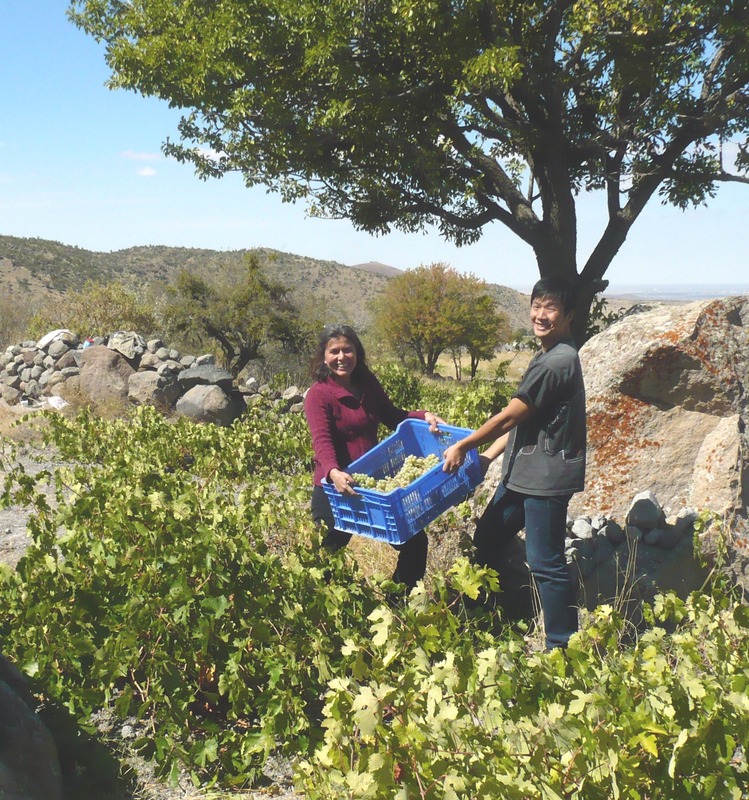 Our helpers start harvesting very early in the morning every day. 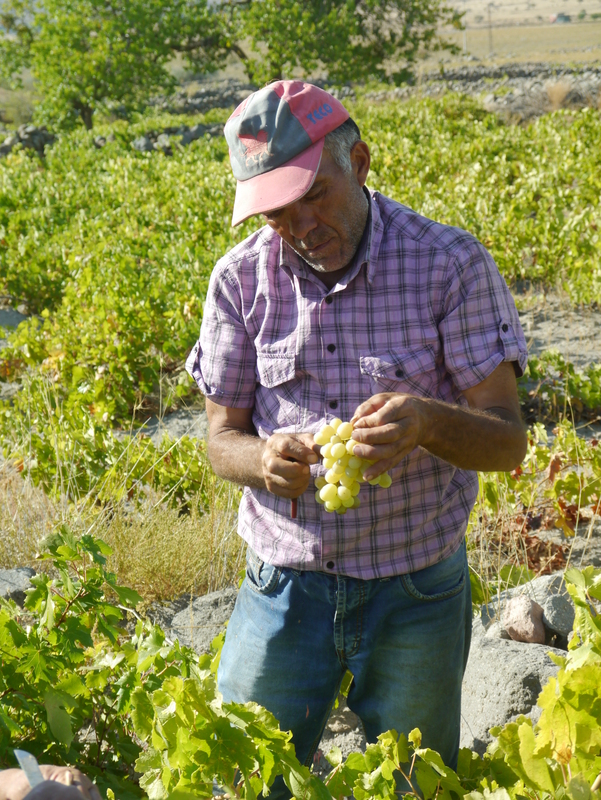 The grapes are picked by hand. Small dirt particles are already removed in the garden. 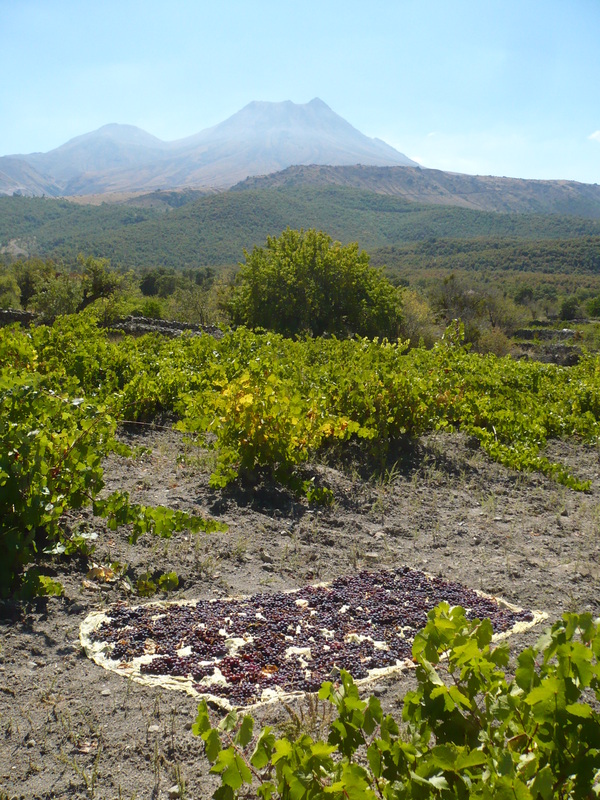 For their own needs our helpers lay certain grape varieties out to dry. 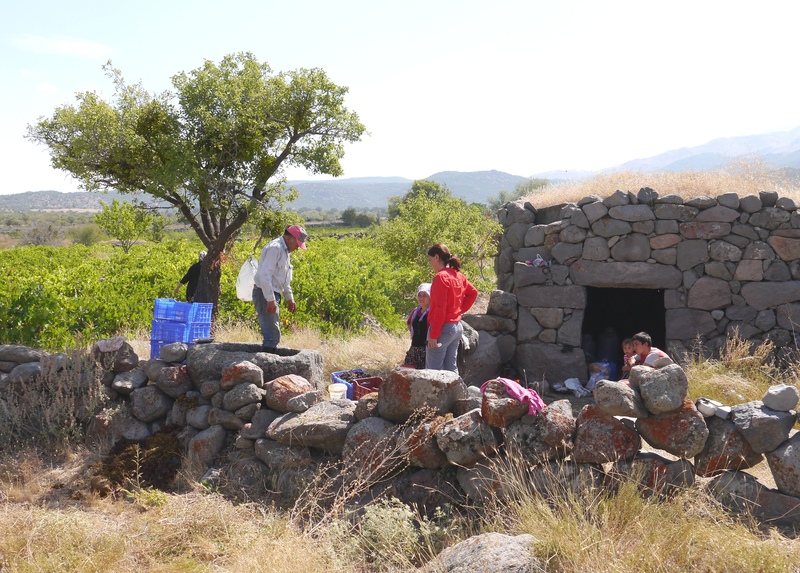 Small stone huts are still part of most traditional fruit-gardens. 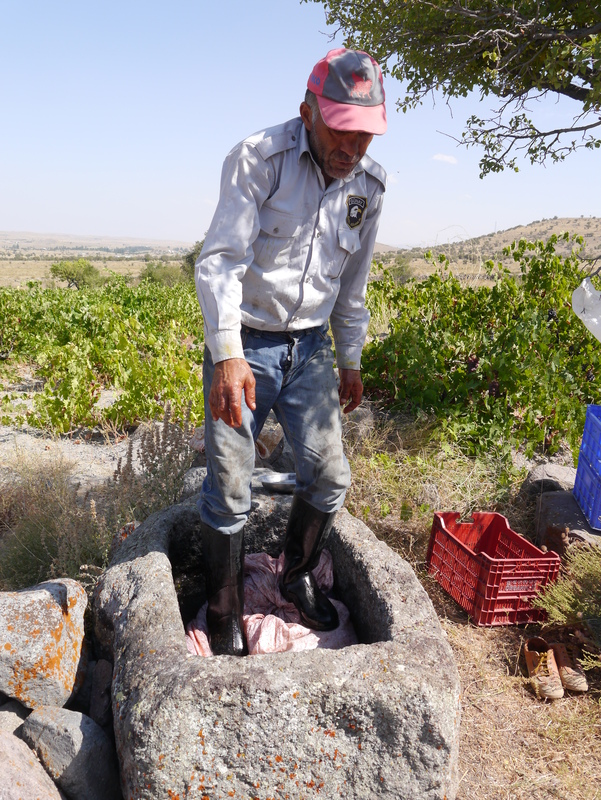 Here, the grapes are crushed by the feet in stone troughs. 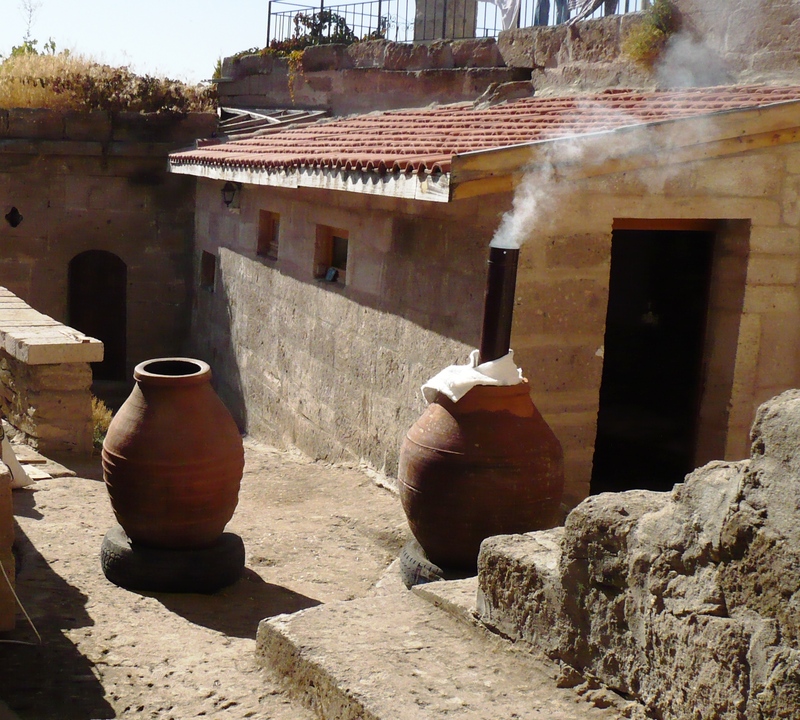 The juice is thickened to syrup on the open fire or processed to wine, in small quantities. 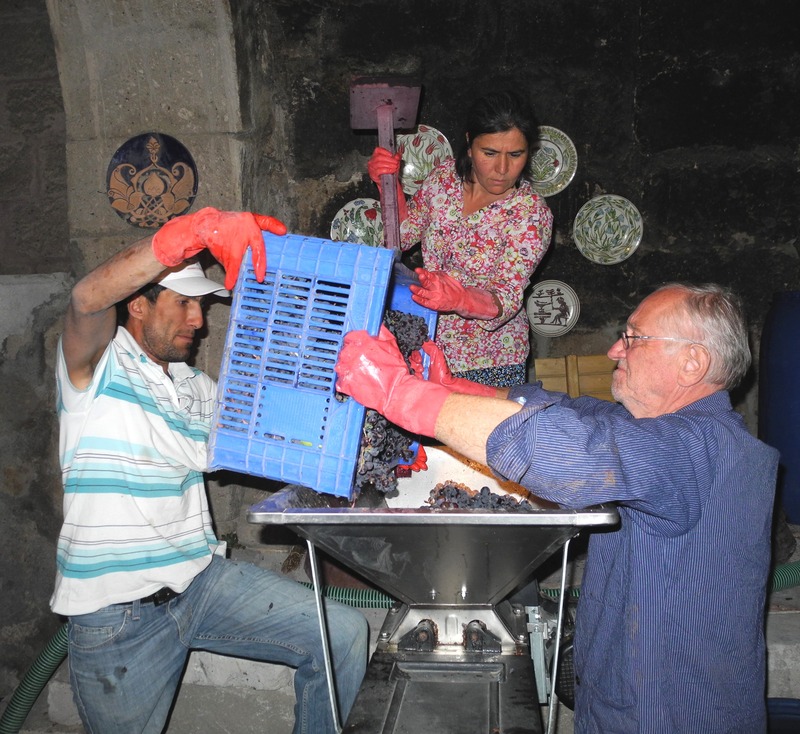 The sack of grapes is stomped and pressed until the juice is almost completely drained off. 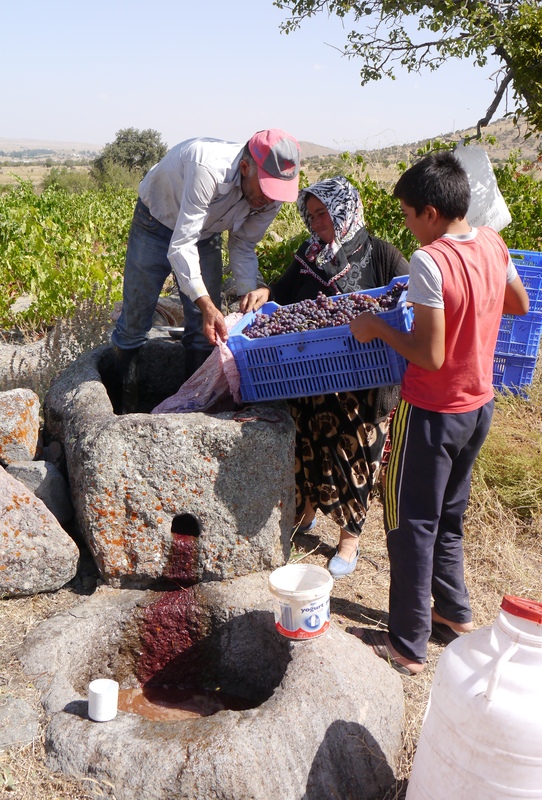 Different grape varieties are used for raisins, vinegar, syrup (pekmez) or wine, which explains why there are so many different types of grapes in private fruit gardens and it is certainly why there are more than 1200 grape varieties in Turkey. 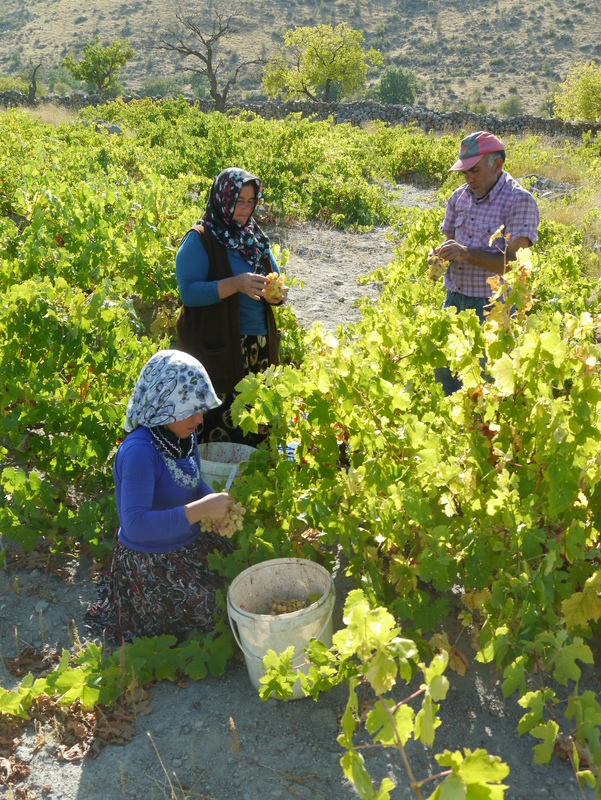 The grape varieties grown in the surroundings of Hasan Dağ and suited for wine-making are brought to our Gelveri-Manufactur. 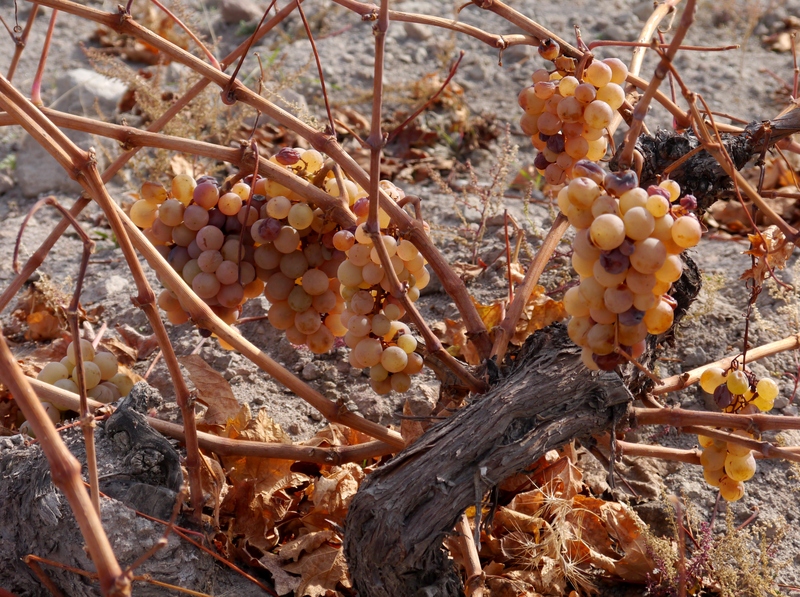 Both red and white grapes are not pressed but only slightly crushed and separated from their stems. After that they are immediately pumped into special fermenting-küps or ordinary küps. 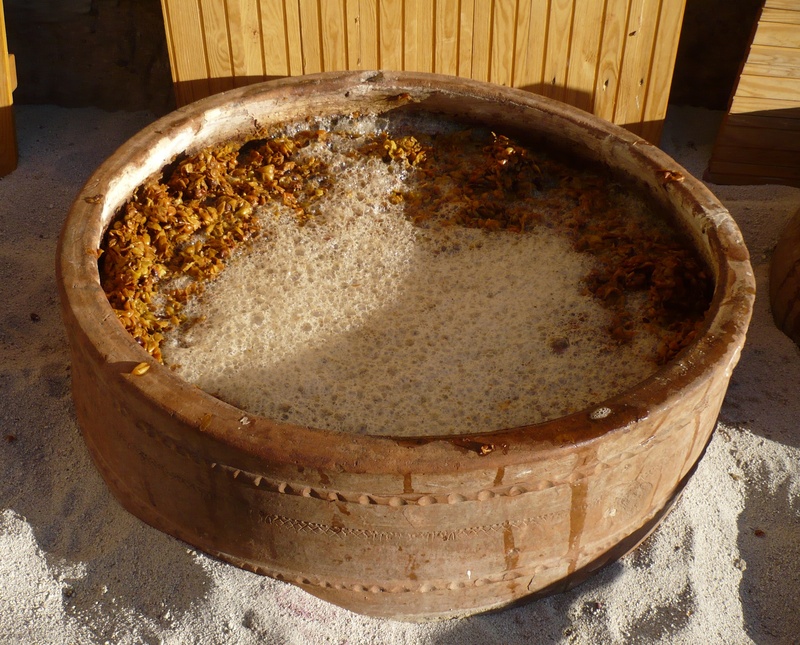 Fermenting-küps are half shells made of clay. 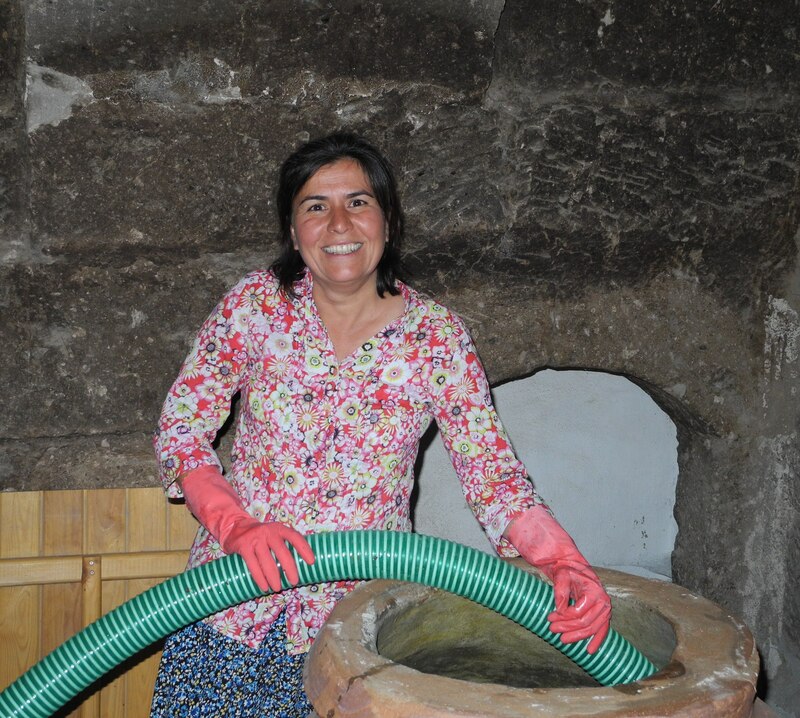 They hold 200-500l and are only utilized during the time of fermentation. 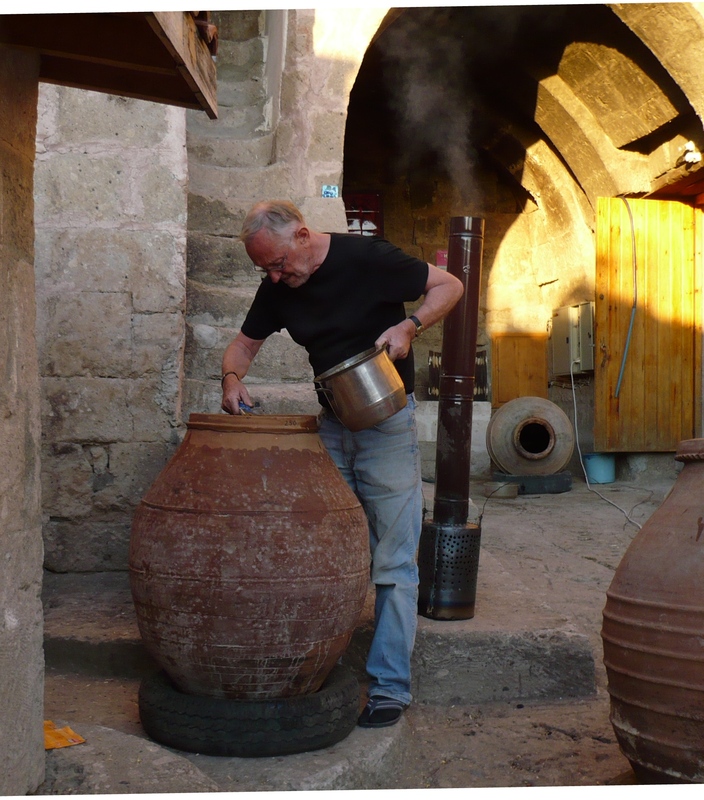 The must cap that develops during fermentation can easily be stirred because of the large opening of the fermenting- küp. We keep the open fermenting-küps and also some ordinary küps (with smaller openings) outside at a half-open space. 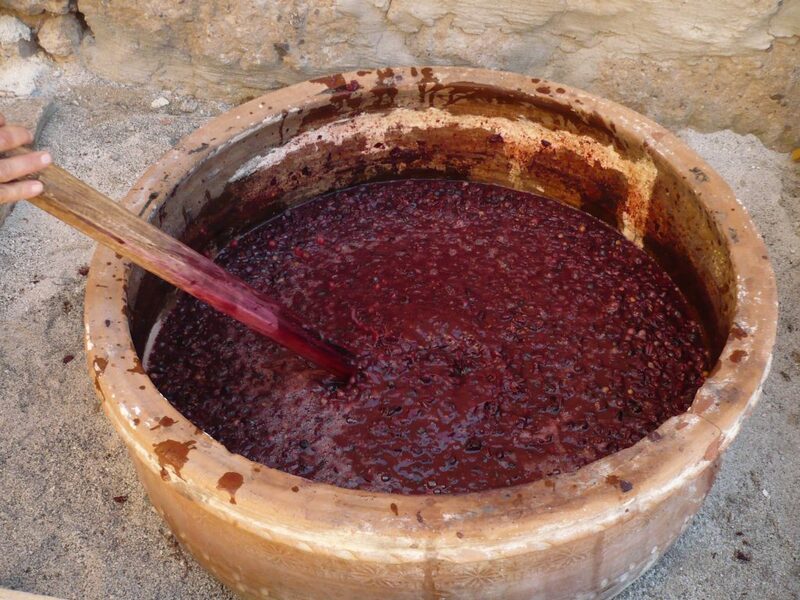 This is where the red wine ferments. 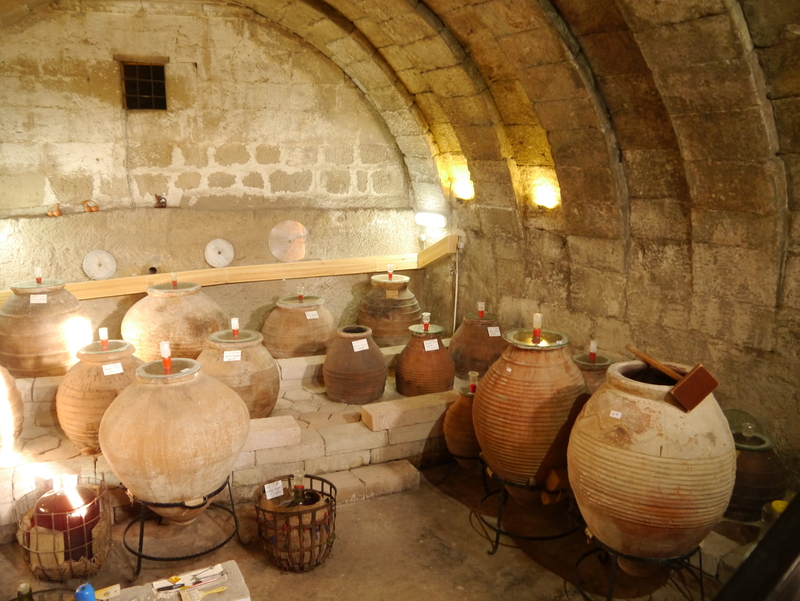 The küps for white wine fermentation, however, are kept in the closed rock cellar. At the end of October most leaves have fallen. 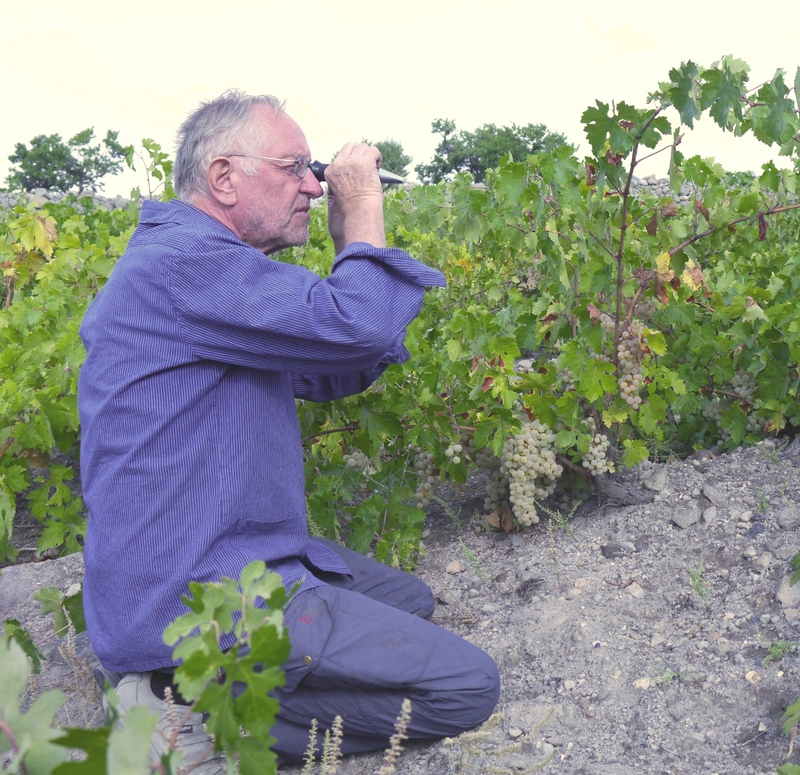 Yet “late vines” still carry grapes. These last grapes have 145°Oe (34°Bx). 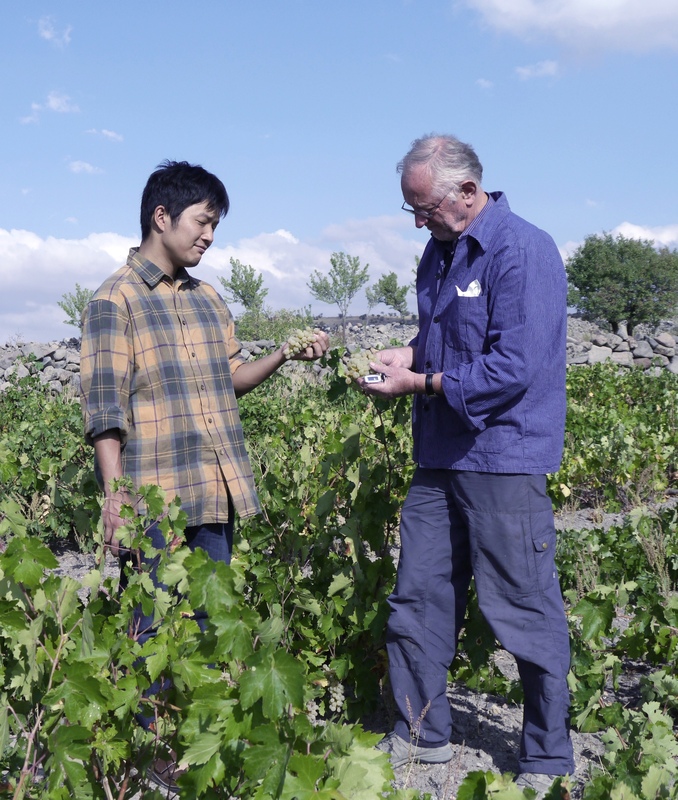 When the thermometer in this night showed -2°C we had the idea to make ice wine one day. January and February are the cold months bringing snow and ice. 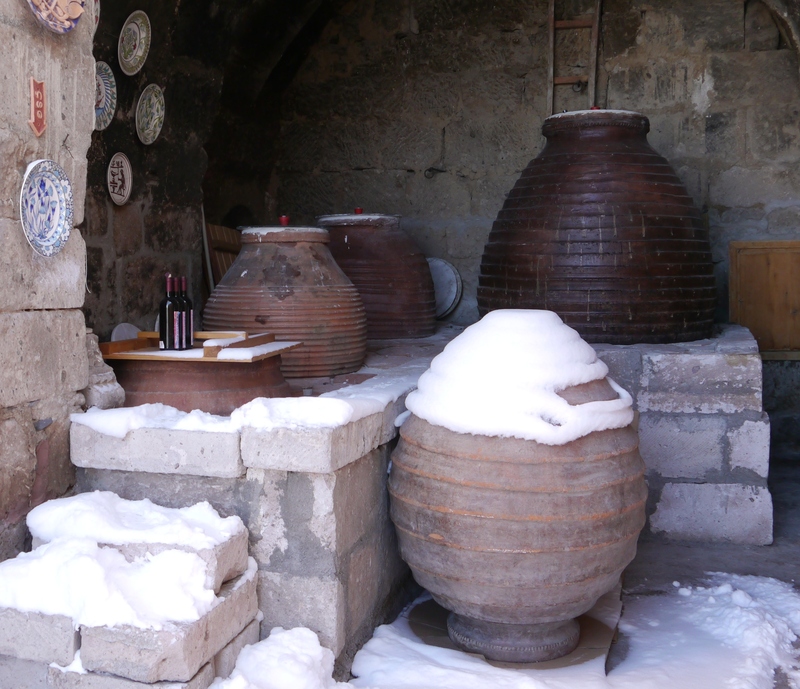 Although it is rather cold in Cappadocia for two to three weeks our red wines have always easily overcome twelve days of -20°C.